I watched a talk by the great Edward Tufte where he mentioned the idea of using elements of the natural landscape, and even video segments, to create visualisations that would play on the deeper parts of our brains evolved to look for patterns and clues - ripples in a stream, the wind in a field of grass. It took him to the idea of Wavefields (the example shows visualisations constructed out of HD videos of water waves and reflections on them). For me it inspired this very brief project done during a 24-hour lastminute.com Hack Day. As one of the organisers it was always a struggle to squeeze in some coding time among all the other tasks, but I always tried to create something coherent even if it was smaller scale. 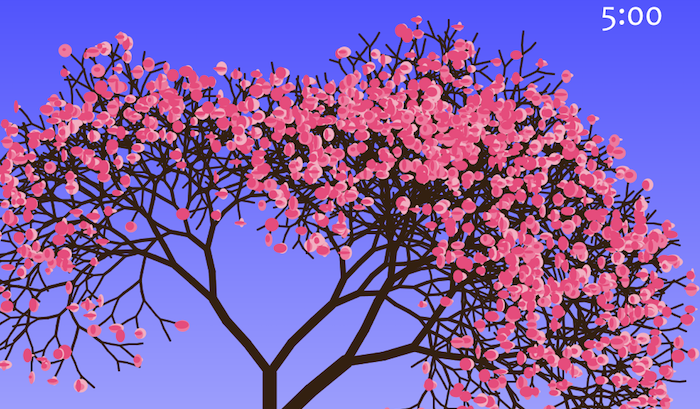 That year I used Processing to render a day's worth of web analytics in the form of a cherry tree - or rather, a tree an hour. The size represented revenue, the branchiness the number of separate sales, and in the final version the leaves were coloured according to the different product categories. You'd see the small spindly 1am tree slowly turn into a wondrously large and full-leaved specimen around 9pm. Trees can naturally represent many dimensions without adding visual complexity (we're used to looking at trees), and form a great at-a-glance ambient visualisation. With a bit more time to devote it would be great to turn this into a plug-in for Google Analytics or Charts.